A proposed amendment shall be presented in writing to the Board, who shall provide copies to the membership of the grotto at least 2 weeks prior to the next regular meeting of the Grotto. The proposed amendment shall be read and considered for discussion at the regular meeting referred to above but shall not be acted upon until the following regular meeting of the Grotto. Amendments require a two-thirds vote of the membership present for adoption. Amendments shall be filed with the current Constitution and Bylaws of the Grotto and in the Grotto Library. Membership in LEG is from September 1 to August 31 and is determined by payment of dues which are set by the Board. A. Regular member: A regular member is an individual at least seventeen years of age and who has paid the required dues, as set by the Board. A regular member must be a current NSS member. A regular member has the right to vote , serve on the Board, if eligible, or as committee chairman, receive current issues of the grotto publication and have ability to check out materials from grotto library. B. Associate Member: An Associate member is an individual at least seventeen years of age who is not an NSS member and has paid the required dues, as set by the Board. An Associate member has the right to vote, serve as committee chairman, receive current issues of the grotto publication and have the ability to check out materials from the grotto library. C. Family member: A family member is an individual who is the spouse of or a child between the ages of 10 – 17 of a regular or associate member . Family members do not receive the grotto publication. Family members who are NSS members AND greater than the age of 17, may nominate candidates for and vote in grotto elections. D. Life time member: Any member who has been awarded a lifetime membership by a LEG Board in recognition of service to the Grotto, prior to 1986 and is a current NSS member. Life time members have the same privileges as a regular member. E. Subscriber: Any individual who pays the subscriber fee as determine by the Board, but who is not a current member. A subscriber is not a member of LEG and does not have the privilege of voting on any grotto issues or in elections. A. Preside over the regular meetings of the grotto. B. Preside over the board meetings. C. Most often serves as co-signer for grotto checking account and other financial documents. D. Complete and submit the NSS and MSS annual reports. E. See that the grotto carries out its duties and purpose. F. Delegate duties and tasks as deemed appropriate. A. Assume duties of the chairman in his/her absence. B. Keep order at all regular grotto and board meetings. C. Has the authority to remove any members or guests from a meeting or grotto activity who may be unruly or causing a disturbance. D. Responsible for familiarizing and educating new members. E. Maintain accurate and current log of grotto Trip Leaders. Provide report to Board and membership as necessary. A. Keep accurate minutes of the regular and board meetings of the grotto. B. Take charge of all grotto correspondence. C. Provides written agenda for Board and regular meetings of unfinished business. D. Responsible for putting meeting notice in media, as deemed appropriate by Board. A. Maintain an accurate and current set of financial records . B. Provide timely, written financial reports to Board and Membership, as necessary. C. Collect dues and fees, as necessary. D. Maintain an accurate record of the membership status of all members and distribute as necessary to Board and Membership. E. Responsible for all disbursements of grotto funds. Co-signs for disbursements. Note: Unless fiscally inappropriate, the co-signer for grotto accounts should be the Chairman of the Board. If fiscally inappropriate, an alternate co-signer should be determined by the Board. A. Edit and produce the grotto publication. B. Responsible for news releases. C. Responsible for exchange of publications with other grottos and organizations. A. Keep a n inventory of and store grotto equipment. B. Responsible for maintaining the equipment in working order. C. Collect equipment rental fees and submit to Treasurer. D. Maintain equipment check out records and submit written reports to Board and Membership, as deemed necessary. A. Responsible for the grotto archives and library inventory. B. Store and maintain all maps, files and exchange publications received by the grotto. A. Maintain accurate and complete record of key distribution and holders. B. Provide report of key holders to Board and Membership, as deemed necessary. C. Maintain locks and keys to cave accesses as deemed appropriate. A. Responsible for sign-in logs kept in caves under the Grotto’s responsibility. B. Organize and conduct conservation projects for the Grotto. A. Maintain rescue call out list. B. Maintain current contacts with other rescue agencies/committees as Grotto deems appropriate. A. Attend MSS meetings as representative of Grotto. B. Submit MSS affiliation report. 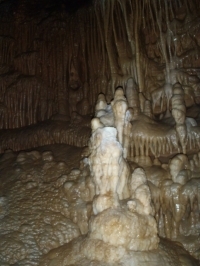 C. Coordinate Missouri exploration/caving activities. A. Attend ISS meetings, as representative of Grotto. B. Submit ISS affiliation report. C. Coordinate Illinois exploration/caving activities. A. Organizes and plans special grotto projects and activities. A regular, associate, life time or family member who is greater than 17 years of age, who has been deemed a Trip Leader by the Board. The Board shall consider nominations for trip leader status when two letters of recommendation are submitted to the Board by two current Trip Leaders. Letters of recommendation should include information regarding the individual’s overall caving abilities, ethics and character. All meetings, both regular and board of LEG shall be governed by Robert’s Rules of Order. 1. Any deliberate act of cave vandalism. 2. An action contrary to the policies of the grotto or the NSS. 3. A negative attitude or action toward the grotto, cave safety or cave conservation. B. Conviction of a misdemeanor may result in disciplinary action, up to and including expulsion, as determined appropriate by the Board. All other bylaws shall be considered null and void upon the approval and acceptance of these bylaws. Policies of LEG shall be determined by each Board, annually. Policies may include but are not limited to the following: Membership Dues, Equipment Fees, Trip Leader criteria.